Feel The Harumph And Do It Anyway! So . . . here’s the thing . . .
. . . the only rule of my Possibility Project is that I’m not “allowed” to do anything I don’t want to, in order to make it happen. However, since I set it up there have been a number of times when I simply couldn’t be bothered to do anything towards it. Not so much “I don’t want to” so much as “I can’t be a**ed” and that’s got me wondering – is there a difference? There’s certainly a difference in feeling. Harumph seems to live in “I can’t be a**ed”. As does Stuck and Blah. Not wanting to do something often comes with a clarity that I simply don’t want to do it. Or, when it feels like it’s something I should be doing but that I don’t want to do, there’s a feeling of force or anxiety attached. So I’m thinking . . . maybe it would be worth experimenting with ignoring harumph and doing it anyway. 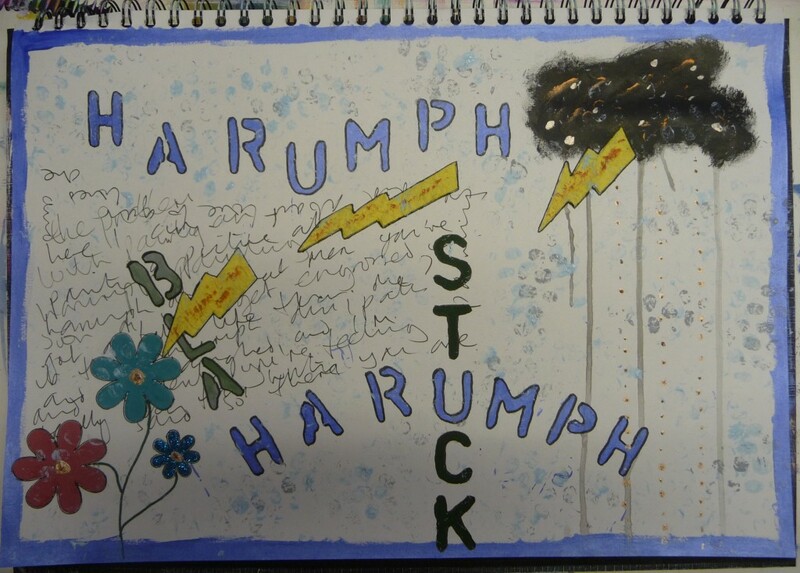 I painted this page in my art journal as part of the Use Your Words workshop. I was feeling harumph so I decided to start with that word. After stenciling it a couple of times I realised that I no longer felt harumph and so journaled about that. Then I felt stuck so I added Stuck. Then I was back to feeling harumph and was bored with that word so I added Blah. Then I had the idea for the cloud and since I was enjoying myself I wanted to capture that in some way so I added the flower. I used handmade paper for the lightning which represented energy giving life to the flower (although my painting partner said he thought it represented feeling harumph and was about to burn the flower to a crisp!!!). Sigh . . .
I’m pleased with the overall result because it does a good job of representing the ups and downs of my feelings whilst I was creating it. Also it got me thinking about the difference between “I don’t want to” and “I can’t be a**ed” – an worthy area of exploration me thinks! Love how this turned out! You arted what you felt and that is the best kind of art in my opinion! Love how this work “evolved” right on your journal page! Its all about tradeoffs, I am thinking! Great page! Thanks Kay and Carolyn. I appreciate your comments!